*Note: there is an updated office post here! I‘m in love with my newly decorated home office. It is all mine (yay!) and I couldn’t be happier. For three years I’ve wanted a space for me. I know it sounds selfish, but I wanted a place to be able to retreat from my sometimes loud and crazy house. A beautiful, eclectic and quirky place to be surrounded with life and color and things I love, but a place to breathe deeply and retreat when I need to recharge. Seriously, I could cry just knowing I finally have that space. It was a long time coming. I feel blessed and ready to tackle the world now that I have a place to feel organized and refreshed. 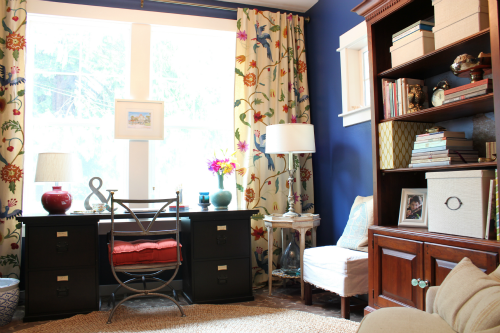 It may sound funny to say these things about a home office, but it is really a gift I needed. I didn’t realize how much I needed it until my girls and I sat in the room for the first time and shut the door. We had our own girl space and it was BLISS, and still is. It is not what most people might consider their ultimate dream office. It is quite small (let’s just say it is cozy!) and I didn’t go out and buy all the latest new everything. But, it is a happy mix of things I already had, things I fell in love with for this space and things that make me feel like spending time in an office! I know many people find peace and solitude in the absence of color and void of “things” but I love being surrounded by memories, scents and visuals that make me smile. Call me crazy but the colors and patterns both calm and rejuvenate me. This is my ultimate happy space. 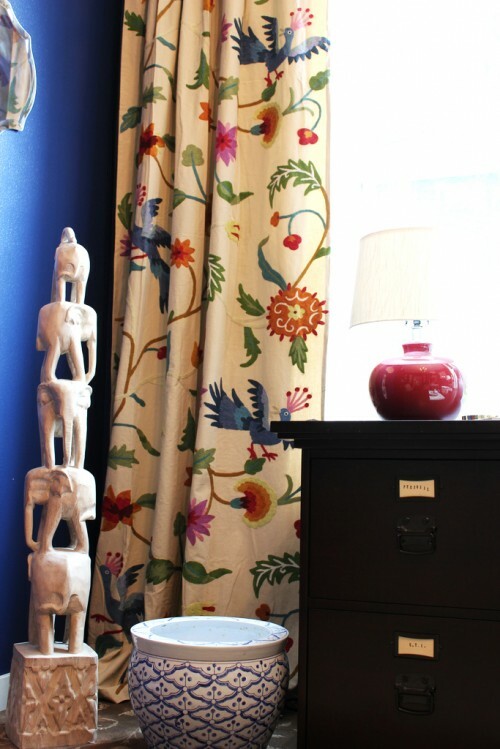 My big splurge on Anthropologie curtains that my daughter Kylee knew I’d love? They make me smile. My fat new orange cushion from World Market on my antique swan chair? Smile. The sketch of my dream come true vacation to Disneyworld with my family a couple of years ago? Happy smile every time I see it. My Anthro candle? I inhale deeply and smile. A little whale and whale print on my wall? Smile in honor of my whale loving girl. The walls in my house are mostly neutral (except for our kids bathroom which is another bold blue color), but no neutral walls in here! I went out on a limb and selected a gorgeous shade of deep blue (Glidden Rich Navy), a perfect compliment to my new curtains. I am extremely happy with how the colors turned out in the office! The mood is just what I hoped for. If you want to splurge on color but can’t see past choosing just white or neutral walls, maybe pick just ONE room and go for it with a blast of color! Honestly, it is probably the most favorite room in our house now. EVERYONE wants to be in here! It is pretty funny. But of course I tell everyone (except my dad when he visits) that it is for girls only. Jack would love to hang out in here but that is a no go. Sorry, Jack. Here is my desk, where I sit to work and talk to you all! I have had this desk for years, since my old house! It is a Pottery Barn and it has served me well. It was nice to not have to buy something new. I reused as much furniture as I could not only to save money, but because I desperately needed the storage in this space to make it a functional office. I love having a view out a window too, not only of my art but of the outdoors. Just being able to see the trees blowing in the breeze as I work is relaxing and inspiring. I adore pairing old with new. I’m still completely smitten with my antique swan chair. It layers the room with the rich character and unexpected quirky charm you just can’t get when you fill a room with all new “perfect” and coordinated furniture and accessories. I do love the eclectic look. These Cute as a Button chairs have lived up to their name and expectations. My girls love coming in and sitting in these chairs to blog, chat and get away from the rest of the house’s activities. I have had that owl bookend probably since I was a kid and the turtle opens up and you can keep little treasures inside like paperclips or pins. I wanted lots of metal accents in the room. The texture and shine of pretty metals adds something special, I think. Remember my file box? Now it gets to hang out with me in here! I adore that box. I wanted to reuse bookcases I already had, but in order to give them new life and brighten up the dark wood without paint I papered the back of them with maps. I also added some blue bubbly knobs to give them just a little pretty blue bling. Some of you get into the Elf on a Shelf. Here? We are all about the whale on a shelf. Along with the whales, we kind of like our elephant statue. Because, well, I’m not sure. Because a tower of white elephants in a room is just cool. I’m pretty obsessed with having cute pens and pencils. I keep them in a mason jar and I just love reaching to grab a pen or pencil and having it be a CUTE ONE! 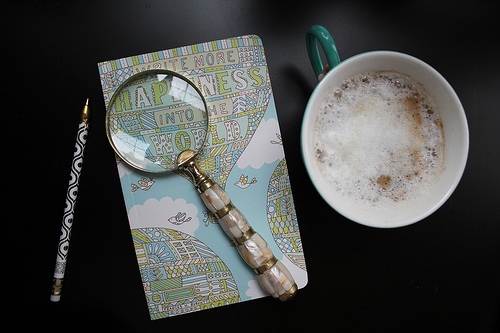 And I love having my favorite Anthropologie mug, a pretty pen and my blogging notebook nearby! It is the little things, right? The round rug is from Pottery Barn. I layered it over our patterned carpet for extra coziness and light. I love how the round shape accentuates the focal point in the middle of the room, the antique crystal chandelier. By the way, that chandelier was in one of my old houses and I’ve been saving it from just the right space in my new house! It is perfect in here! And that subway art outside the door is from Red Letter Words and has names of places from our hometown of Portland, Oregon. I covered the back of the lawyer’s bookcase with some blue polka dot fabric. I like how it brought some whimsy and girlishness to a serious cabinet. I love a room with contrasts and things that are collected and unexpected! 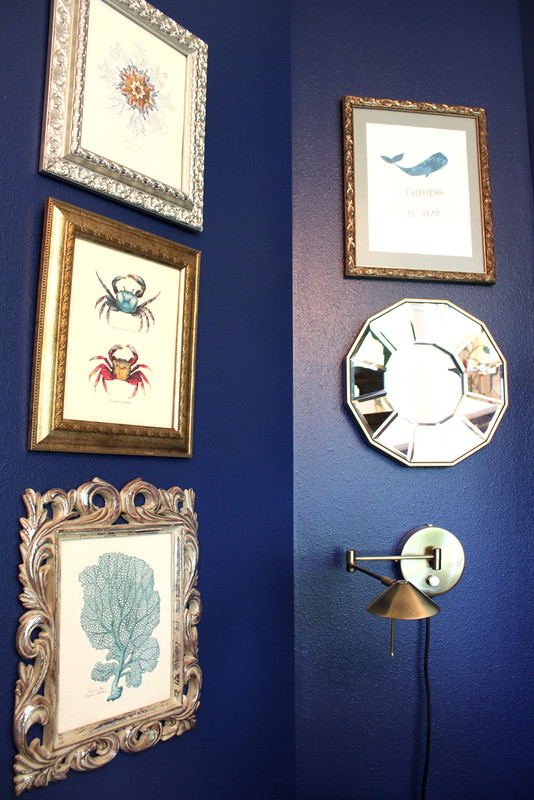 Here is the sea life art I got from Etsy (Vintage by the Shore) in the mixed metal frames. The swing arm plug-in reading lights are perfect for creating a little mood lighting (they are on dimmers!) or reading in the chairs. I got that sweet little whale art (above the mirror) from Britt Herman on Etsy. My daughter had featured it on her blog and since I knew she loved it so much, I just knew we had to have it in our girls oasis! I FREAKED OUT when I saw that boat on LuxeYard. Isn’t it the CUTEST THING EVER? I got from a LuxeYard sale (you can sign up for free to see the housewares they currently have and watch their sale offers via my invite link). So, there you have it! My “finished” home office. If you were around yesterday you saw I have already started some new home projects. I have lots of ideas in mind for how to bring some of the elements from this office to other rooms, while at the same time creating new spaces that have their own personality and flavor. I cannot wait, I’ve got a few makeover surprises up my sleeve too! Thanks for coming by! Now you’ll know where to find me next time you visit, I’ll be in my office! I’ll put up some sources and answer any questions in another post so let me know if I missed anything you wanted to know! Absolutely beautiful. If I were you, I’d NEVER leave that room. The wall color is fantastic. Thanks for sharing. Everything in your cozy office looks so pretty. All of your work, certainly has paid off. I love everything you’ve done! The Anthropologie curtains are gorgeous! I noticed that the link to my blog didn’t work, so I thought I’d leave it here. What a beautiful and fabulous office! So excited for you to have this space to create and work. Love the curtains and chairs!! Love, LOVE your changes! Cozy, girly, quirky, fun…just perfect! I LOVE the barrister’s bookcase! What a great space!! Enjoy! Your office is perfection! I love the rich wall colours! You have inspired me to rethink my own office…. It is so beautiful. I love the wall color and those curtains are to die for. I’m so excited to see all you other dreamin’ projects come together also. this room is SERIOUSLY stunning. STUNNING! love the whole room – but especially those drapery panels – love, love, love them!!! Love the colors! I’m updating my office now and just yesterday was thinking of lining the back of my shelves with paper. How do you do it without damaging the wood? Beautiful office. I love all the colors and patterns and that you’ve surrounded yourself with all the things that you love and inspire you. What a great space to relax and create! I love your space!! I love that you kept your wood tones (no paint!) and used rich, bright colors! What a breath of fresh air in a blog-sphere of painted wood and washed out ‘color’. I love it! In fact, I’m thinking I may just copy your wall color in my living room, in which the red is getting old. Love the curtains too–it’s all so much fun! Thanks! I totally understand and agree with having a space of your own. Your study turned out so well. I really like the blue walls and accents you’ve installed. The room has so many charming and personal touches. I love the cute as a button chairs. Great job, congratulations. This is absolutley beautiful. I love the curtains the colors are great.. The chair looks comfy. Just perfect. 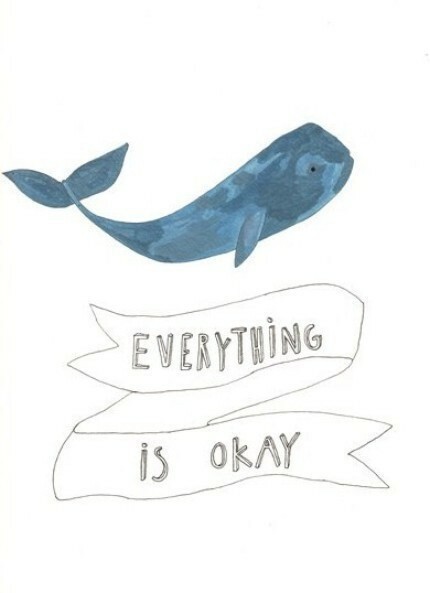 love love love it…the blue walls…fantastic…the whale…may fav…so good!! oh how i love your room. isn’t nice to get one thing completely finished? The thing I like most about the room was that everything is not matchy-matchy. It all goes together so well! 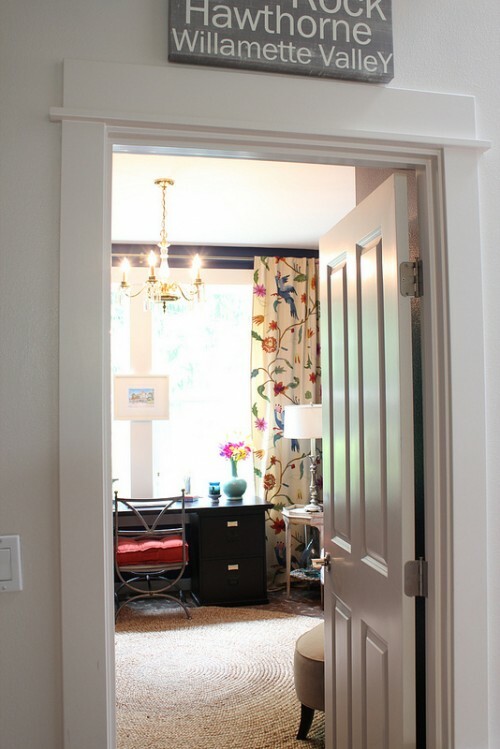 Love the bold colors as I am not a fan of the new yellow/grey trend in every room. 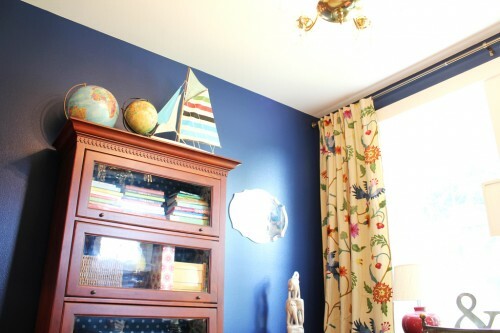 The curtains are so beautiful – they are really a gorgeous starting poin for noticing all the art and knick knacks. Bravo! It was so worth it. Great job. 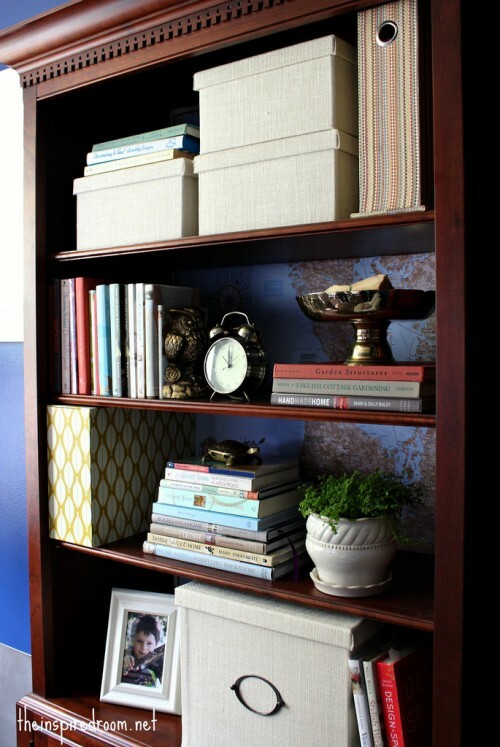 Hi Melissa… I keep hearing about covering the backs of bookshelves with fabric. I LOVE this idea, but how do I do it? What do I use to make the fabric adhere? Do I need to do anything to the edges of the fabric to prevent fraying? That wall color is absolutely breathtaking! The drapery fabric looks amazing, everything just pulls together perfectly. May you have many happy years ahead there! Melissa, it’s beautiful! I’m so happy for you that you have this gorgeous girl space. I feel that way about my bedroom- as a single gal, it is purely mine and I love it! I adore the choices you made- the colors, THOSE DRAPES!, the furniture- it’s all Melissa and it’s all lovely. Thanks for letting us in to take a look! I am a faithful reader of your blog, having started in after a 31 days series a la Nester. I do not comment often on any blogs, but felt that this one was deserving of some kudos! WELL DONE on creating a space that so reflects y’all. I follow (and totally love) Courtney’s blog. Enjoy every single one, which caused me to grin wide when I saw you got her whale print. Yay! I hope you ladies have many, many hours of happy and productive time. The office looks like the serene and creative space that it should be! So happy that you have such an inspiring place to work out of! Can’t wait to see what you have in store for this summer! That looks awesome! Unbelievable room. I would love to have an “office”. I have to settle for a corner in the living room. looks great! love the wall color! 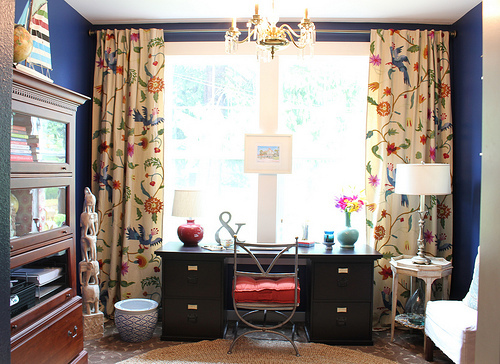 I adore those curtains and with the bold blue they are amazing. Congrats on doing a great job for your room. 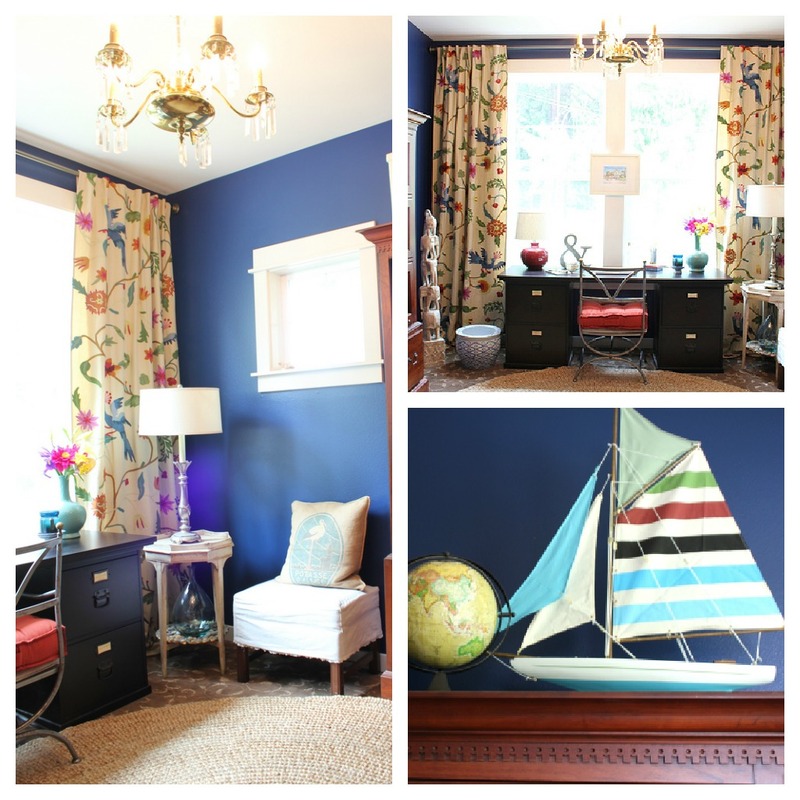 We love bold color here in our cottage, so the blue is amazing – especially with the white trim! Beautiful curtains, furniture…it all works really well together! Glorious! I am especially inspired by the mix of antiques and re purposed furniture that gives a comfy atmosphere without being cluttered or too modern. I am looking around my living room/creativity corner central/main room with new eyes…. I just featured that same jute rug on my blog! Love the wall color. It is just the color I was looking for. Guest bedroom project in full force! I’m so glad I stopped by today – just in time for your office reveal! I had so much fun peeking at all the pretty spots. You’re right – it’s the little things that count – and in your case they add up to such a pretty place. 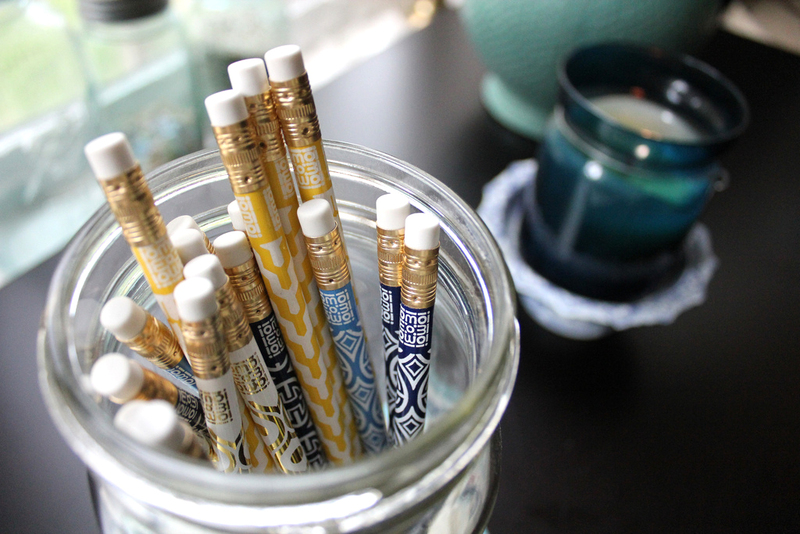 Love the whale – love the stack of white elephants and love that you even have pretty pencils and pens. Thanks for sharing. Beautiful !! What I love is the mix of new, inspirational items (curtains, chairs) with things you already had. It makes such a warm room full of character. 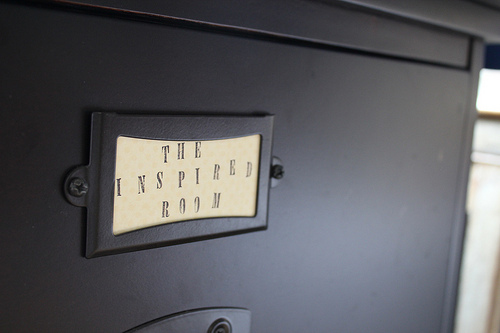 An inspired room, indeed !! gorgeous! such a happy, sophisticated, summery, inspirational room!! What a wonderful room. My favorites are the drapes, the background wallpaper touches, and the whale pictures. I’m speechless – just completely and utterly inspired. The color, the personality… it’s perfect. I love this room! It’s so inspiring and cozy and feminine without being froo-froo girly. There is no doubt it is the haven of a smart, sophisticated woman! Love the curtains!…..Holy cow the room is enchanting. Our Library is painted burnt red and everyone seems to love it. I think I forget sometimes how much I love a deep color…..I can get lost in my love of white….thanks for the reminder….to add color, I have a small study that I want to do over…..now to find the perfect color…..any ideas? I know, I have plenty of white and neutrals so it was fun to try out a room enveloped in color! Maybe pick one of your favorite colors and give it a try! 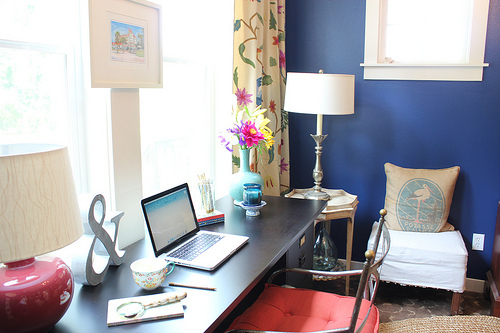 I love, love, love your home office!! I have a lot of quirky and cute things that surround me at my desk, which is in my bedroom. My bedroom is small but it’s all me. I also papered my bookcase but not with a map. I used (on one shelf) a piece of gift wrap with lots of stars on it, (on another shelf) pages from a cutesy calendar that featured cartoonish angels dressed in gingham dresses with sneakers, (on third shelf) gift wrap from the Metropolitan Museum of Art that came in a book entitled “English Floral Patterns-Eighteenth Century Designs by William Kilbum” and finally a repeat of more angel calendar pages. I should take a picture of my room sometimes and post it. Sounds like a perfectly personal and wonderful space you have there!! You should post it sometime!! Can I come over and snuggle with those curtains?! Worth the splurge! I love the blue walls with the dramatic print of the panels…LOVE!!! Your office makes me smile. Thank you for sharing all the little details. I love the tufted chair with the different buttons. It’s the little things like the scented candle, cute pens and gifts from loved ones that makes a room so special. I. Love. It. It’s cheerful, lovely, and full of colorful personality! Just wonderful!! What a beautiful room! That wonderful fabric really sets the tone and ties it all together. And the blue on the walls is a total wow! Great Job!! Truly wonderful update!! ENJOY!!! I’ve had a crazy busy two weeks and I was just scanning my inbox and almost missed this! Oh I would have been sad. Melissa you created a stunningly gorgeous oasis! And the Anthro curtains. They and the blue walls rock my world….way over here in PA!!! Phew, glad you noticed your email!! :-) Thank you so much for coming by to comment, Diane. :-) Your comments are always so appreciated! Looking at the before and after photos, it’s hard to believe that’s the same room! How wonderful that you have that big window to sit at, and that fabric frames it beautifully. Love, love, love the unique details all over!! I need an office like that to get inspired! wondering where you got the light wall sconce in your new office. Oh wow oh wow, you are just full of surprises! That bold wall color really paid off, it looks terrific especially with your anthro drapes. Another drool worthy room…nicely done! I think you did a fantastic job. So jealous, but inspired to create my own space. The curtains are gorgeous and I love the pencils! Great job! It’s beautiful. I feel jealous now. I may have to think of getting one soon. One thing, you may have to get a new office chair. That one is cute, but it won’t do your back any favours. 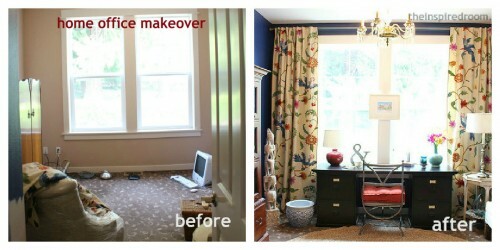 To quote “You’ve come a long way Baby!” Before and After pictures of office-WOW, fantastic! Love all the eclectic mix materials. I can easily say, you have graduated from the not-so-crafty DIY to top-of-line DIY and all on a budget. 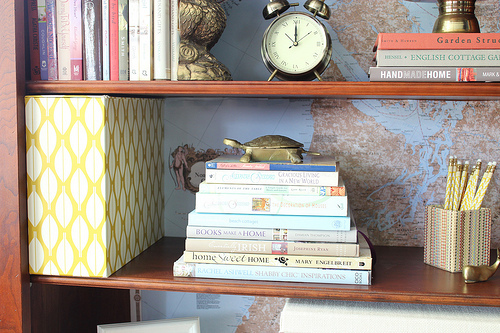 Reusing items in your home in a different room makes it new to that room, and I’m a Flea Market Diva. I have a wonderful flea market that more than 1/2 of my apartment has come from. Also when our church has a yard sale once a year, can always pickup great finds for mere pennies to for most part not over $5. It’s also a great way to clean out closets. Sorry, I got off tooting my own horn-just wanted to say, LOVE, LOVE the new office. I have a study. We girls use it. We girls are not happy with it right now. We girls are now inspired! We girls are determined to put a cahir in their now. Thanks! Beautiful! I have been going back to your post a couple of times since yesterday. I love the dark navy blue on the wall and the drapes, everything is lovely! Wow! Great room. I hope you enjoy your new space for a long time to come. Wow! Looks fun…will your new office be getting new hardwood floors also? You rock! And so does that pelican pillow. I’m loving your bold choices! What a beautiful room! I love all the details and the bold colors. How exciting to see the transformation be complete. I can’t wait to someday go through the same process! I LOVE all of the color!!! Gorgeous!! What a beautiful, lovely space. I love that it is “just for girls,” too! :-) I love spending one-on-one girl time with my mom in her office. It is so special. Congratulations! 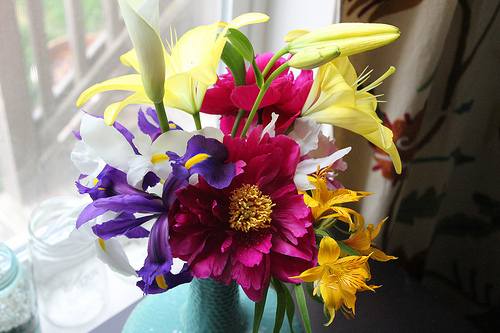 I can’t wait to see what other decorating tricks you have up your sleeve! Gorgeous, cozy, and welcoming – three words that I think describe your pretty new office (or should I call it a retreat). I just know you are going to love blogging from there. It looks wonderful! I love that you used colours and items that really have meaning to you. I think it is great that it is your ‘girl’ space and sweet that your dad gets to spend time in there too. I love it. It’s very unique and cozy and personal! I know you will enjoy! Your office turned out amazing! Very different than what I was expecting but i LOVE the bold navy blue color for the wall and the over all theme is so adorable. Where did you get the chair or was it done by yourself? Melissa, that is a gorgeous space! I am trying to do something just as inspirational to my “home office” here in Adelaide, Australia. You have certainly given me some inspiration, so thank you! 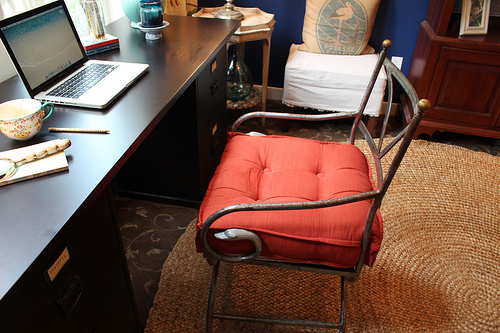 Love the chair at your desk, if only I could find something similar here – will have fun looking. I love this office – I aspire to build one myself soon. I will, one way or the other, work in a couple of those button chairs. I especially like the window, so you can simple look up to get “away” for a moment. What a gorgeous space! I love every little inch of your office. (May I move in?) Those curtains are so pretty and you’re right about how the blue works so well with it. Lovely details – thanks for sharing. 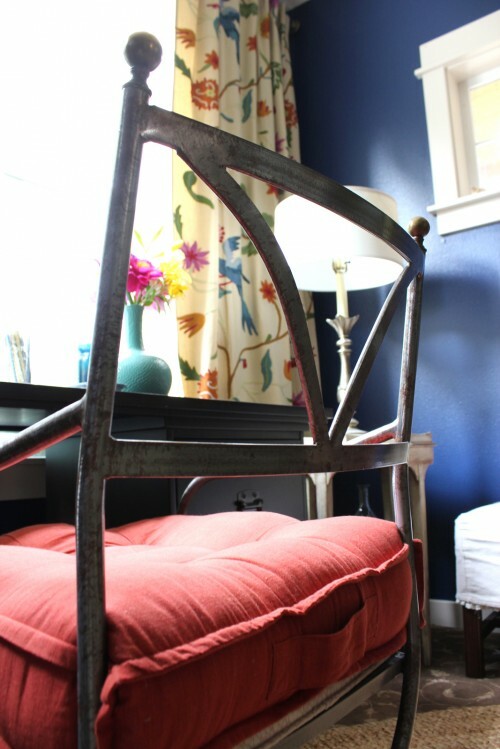 This is an inspiration for me to get going with redoing my own space, a bolthole. This office is so you, it is so beautiful. Enjoy your “room of ones own”. So beautiful! You did a beautiful job! 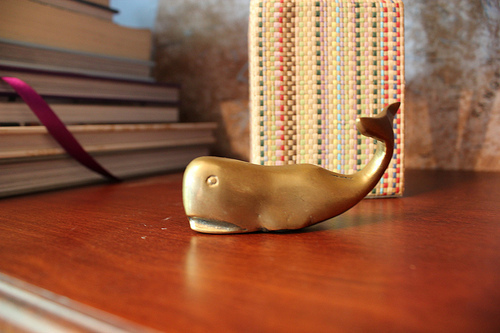 Where did you get that beautiful golden little whale? I want it so bad! It’s really great! I love the curtains…everything goes so well together. Nice to have a space to call your own! I am about to make my dining room into my home office and came here looking for ideas. The one thing that took my breath away was how BIG your window looks just because of the placement of your curtains. I am so glad you posted the “before” pic. I was thinking your window was giant, but it looks about the same size as mine. Can’t wait to hang some new curtains now! :) Thanks! What a beautiful office! So tranquil and eclectic. I need this desperately in my home. Are there people like you who come out and do this for those of us who are “challenged” in this area? I live in Orange County. Wow Melissa! That office is stunning!!! So gorgeous! And I’m with you on splurging on those curtains. The room wouldn’t be the same without them. I went over to Anthro to see what other goodies they have and I think I found some that would go great in our family room! 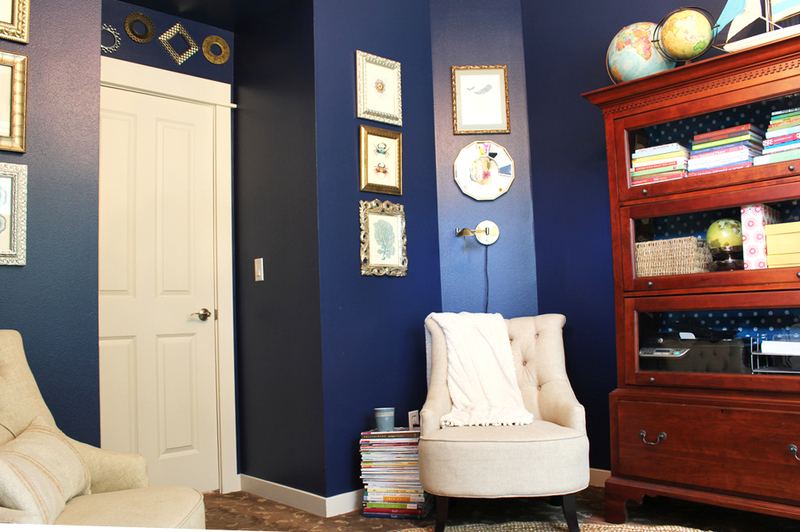 I painted one of our guestrooms almost that exact shade of blue. When it was going up, I panicked a little and most people’s eyes kinda bugged out but I kept going! Now it is the most peaceful, serene room in our house. We call it the “blue room” – what else??!!! I can’t wait to see what kind of creativity comes out of that room! Thank you so much :-) We LOVE the color. 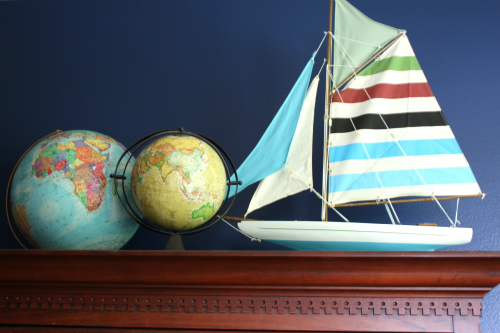 It makes the room a fun destination in our house! What a lovely room, Melissa So eclectic! Well done. Can you tell me where to purchase the desk & pink lamp? I was wondering what length you went with for the curtains and also how you go about determining the proper length to get? I live in a third floor apartment (so the ceilings aren’t super high) and I want to buy curtains but don’t want to not be able to use them in the future if I move because they are too short. Do you have any advice for what length curtains to get, and what a standard length would be for most homes? I am totally in love with the blue in your office on the walls. Wow. I am turning my dining room into a reading/dining room and would love to get up the nerve to paint the beige/brown walls a brilliant color like you did. 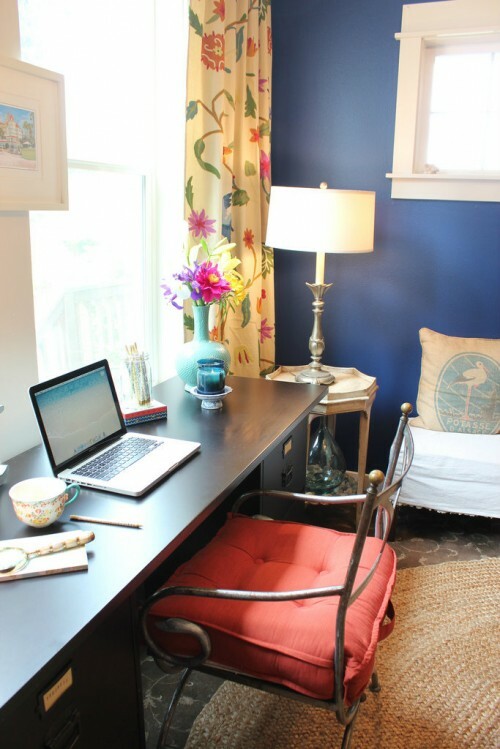 Your room is heavenly, as is your blog not to mention your daughter’s wonderful blog! I love the level of detail in the room. Amazing job!! !